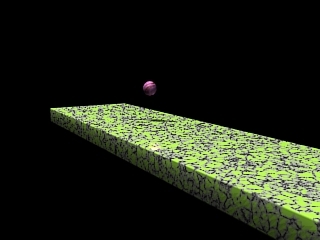 I imagine this is something that everyone who has every taken a class in 3D animation (or 2D animation for that matter), has created: The Bouncing Ball. It is a simple exercise to teach one the basic principles of squash and stretch, and making something move believably. It's not the most exiting thing I've ever created, but it was all hand key-framed, of course. None of it was a dynamics solution. I'm quite proud of it, and even my teacher said my animation had the most realistic motion out of the class.